Who doesn’t like a good parfait? Some of the most delicious parfaits I’ve eaten were made from yogurt. That’s why when I got a hankering for one, I made this Key Lime and Strawberry Parfait using Dannon® Oikos® Traditional Greek Yogurt. Since Oikos Yogurt needs to be refrigerated, it’s ideal to make these parfaits right before serving. I picked up everything I needed at Walmart including Oiko’s Traditional Green Yogurt. You can earn an offer through Ibotta for purchasing it at Walmart! The Ibotta offer is good on either singles or the 4 pack of yogurt! Making this parfait was super quick and easy. 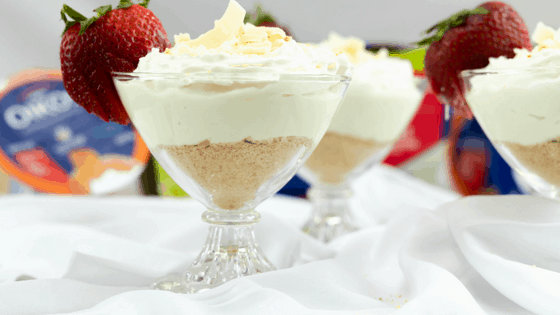 I used graham cracker crumbs, whipped topping, Dannon® Oikos® Key Lime Flavored Traditional Greek Yogurt and white chocolate shavings. It was so good! The family really loved it and it was the perfect snack disguised as a dessert! It was really super quick to whip up as well so that’s a plus in my book!! Layered with graham cracker crumbs, yogurt, and whipped cream. Topped with white chocolate shavings and garnished with a fresh strawberry. Start by adding a layer of graham crackers to 4 glasses. Top with whipped cream and garnish with white chocolate shavings. Slice strawberry and hang on side of dish.